Chaucer has gone down as one of the most important broodmare sires in history. The son of the legendary St. Simon and the immortal mare Canterbury Pilgrim was a good but not great race horse. Although he was not a big horse, Chaucer made his mark at stud through his daughters. Perhaps the most accomplished daughter of Chaucer as a great producing broodmare was the remarkable Selene. Serenissima, the dam of Selene, was a small mare by Minoru. Her own dam is Gondolette by Loved One, a son of the mare Pilgrimage. Lord Derby purchased Gondolette with Serenissima in utero. Minoru, winner of the Epsom Derby for King George V, is a son of Cyllene, a direct descendant of Stockwell through Bend Or and then Bona Vista. This part of the pedigree of Selene was very important to Lord Derby. He could now her breed to his great foundation sire Phalaris, a grandson of Cyllene. This gave two crosses of the blood he considered as essential for further improvement to the resulting foal. Selene was also inbred to Pilgrimage 3 x 4, the second dam of Chaucer. Selene was an exceptional runner. She made a remarkable eleven starts as a two year old. She won eight races including top class events such as the Cheveley Park Stakes, Rous Memorial Stakes and the Houghton Stakes. As a three year old she continued her fine showing of class by winning the Nassau Stakes, the Park Hill Stakes and the Hampton Court Great Three Year Old Stakes. In the latter she defeated Lady Juror, Diligence and Pondoland. Selene thus completed her second consecutive eight wins in eleven starts season. Fully grown Selene was only 15.2 hands, but was a solid filly. She possessed a good deep chest and rip cage, strong boned legs and ran with excellent balance. Selene was a game and honest filly who enjoyed her racing. Her colour was bay with absolutely no white markings of any kind on her body or legs. Lord Derby retired Selene to the breeding shed following her three year old season to Side Hill Stud. It is as a broodmare that Selene would take her place in the history books. She quite simply became one of most influential Thoroughbreds of the twentieth century. Her first three foals all become extremely influential sires of varying degree. 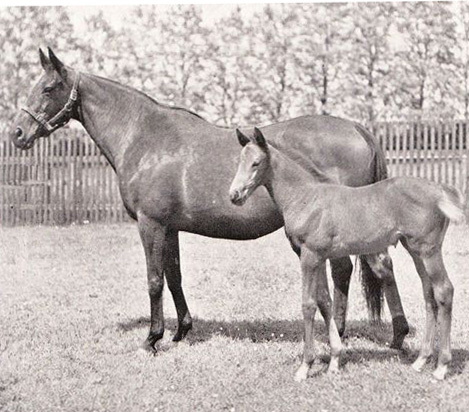 Sickle and Pharamond were the first two, both sired by the legendary sire Phalaris. Her third foal was Hunter’s Moon by Hurry On. Hurry On was a top class stayer, as opposed to Phalaris being a speed/sprinter type. Hurry On was a tall almost seventeen hands stallion that sired many of the important long distance runners in the early part of the twentieth century. He founded a strong line of stayers that include Coronach II, Precipitation, Chamossaire, Sheshoon and Sassafras. Hunter’s Moon was a slight cut below the best of his generation on the race course although he did win three of eight races. The Newmarket Stakes and the Gratwicke Produce Stakes were his biggest scores. Hunter’s Moon was then sold to Argentinean interests and exported to that country. Here Hunter’s Moon founded a very successful line and was the champion sire in his adopted country. The first two foals from Selene, the full brothers Sickle and Pharamond, would both be exported to the US. Each brother became founders of their own strong sire lines. Sickle stood one season at Woodlands for Lord Derby before his exportation to Joseph E. Widener’s Elmandorf Farm in Kentucky. The deal was to be a three year lease with an option for outright purchase, which Widener would exercise. Sickle sired giant killer Stagehand (Santa Anita Derby, defeating Seabiscuit, Empire City Handicap defeating Fighting Fox and the Narragansett Special over Bull Lea). Sickle also sired Star Pilot (Futurity Stakes, Pimlico Futurity, and the Hopeful Stakes) and Reaping Reward, a half brother to Whirlaway, (New England Futurity, Kentucky Jockey Club Stakes), as well as Brevity (Champagne Stakes). The son to continue the Sickle line however was Unbreakable (Richmond Stakes). Unbreakable was raced in England by Widener and then returned to the US for his stud career. Unbreakable sired Preakness Stakes winner Polynesian, the sire of the legendary Native Dancer. Pharamond won the Middle Park Stakes at two but was always slightly behind the top horses in his generation. One of those top colts included stable mate Fairway. Pharamond was sold to Hal Price Headley and sent to Beaumont Farm near Lexington for stud duty. The sale came the year before his older brother entered the stallion ranks in America. He became Pharamond II due to name duplication in the US. Among the more notable progeny of Pharamond II was Cosmic Bomb (Arlington Futurity, Cowdin Stakes, and Lawrence Realization). Cosmic Bomb is the sire of Cosmah. She in turn is the dam of champion Tosmah, leading sire Halo, Queen’s Sucree, Maribeau and Father’s Image. Pharamond II is also the sire of Menow (Champagne Stakes, Futurity Stakes and Withers Stakes). Menow became a successful and influential sire through his son Tom Fool (1953 Horse of the Year). The latter is the sire of the great Buckpasser and champion Tim Tam. Selene produced another sire of importance in 1930. From a cover by Gainsborough, this son of Selene would influence multiple generations in breeding excellence. We are talking here of the immortal Hyperion. Hyperion was her sixth foal and was also, apart from his colour, the closest in size and appearance to any of Selene’s offspring. Hyperion was not only a great stallion, but before he entered stud he was one of the most beloved winners of the Epsom Derby. Standing no more than 15.1 hands, Hyperion had a very quick turn of foot and could carry his speed to classic distances. During his three year old season Hyperion not only won the Derby, but also the St. Leger Stakes, Chester Vase, and Prince of Wales Stakes. As a two year old he won the Dewhurst among his three stakes wins. He raced at four and took the March Stakes and the Burwell Stakes. As popular as he was on the track, Hyperion would become a legend as a sire. “The Mighty Atom” was the leading sire in England/Ireland six times. He led the broodmare sire lists four times. Hyperion became a sire of sires and breeders around the world were lining up to acquire his get. He founded powerful sire lines in North America, Australia and Europe. Hyperion’s daughters became coveted broodmares and contributed enormously to his legacy. A brief list of direct descendants will tell the story. Aureole, St. Paddy, St. Crespin, Vaguely Noble, Owen Tudor, Tudor Minstrel, Abernant, Pensive, Ponder, Tomy Lee, Kahled, Swaps, Chateaugay, Affectionately, Heliopolis, Alibhai, Summer Tan, Olympia, Aristophanes, Forli, Forgo, Star Kingdom, Nodouble, Biscay, Todman, Hycilla, Sun Chariot, Hypericum, Godiva, and many more are direct tail male to Hyperion. The list of champions and influential sires in direct female ascendance from daughters of Hyperion is also impressive. Nearctic, Highclere, Height of Fashion, Alycidon, Ribocco, Ribero, Court Harwell, Pretense, Mill Reef, Tesco Boy and Northern Taste. Many in this list have direct descendants that are excelling into the twenty-first century. Highclere for example is the third dam to champion racer and current leading sire Deep Impact. Nearctic is the sire of Northern Dancer. The latter is the only sire to out do Hyperion as a sire of sires in the twentieth century. Hyperion was the result of the only mating between Gainsborough and Selene. She was bred to a son of Gainsborough twice. Following the success of Hyperion, Selene visited the court of Bobsleigh. The second foal from this pairing was the filly All Moonshine. All Moonshine was a modest winner in racing but an excellent producer in the tradition of her dam. All Moonshine produced Mossborough (Liverpool Autumn Cup, Churchill Stakes) by Nearco. Mossborough in turn sired Ballymoss (Prix de l’Arc de Triomphe, Irish Derby, St. Leger Stakes etc). Other offspring includes Cavan (Belmont Stakes), Craighouse (Irish St. Leger), and Noblesse (Epsom Oaks). Noblesse is the grand dam of I Will Follow, the dam of Rainbow Quest. The female line of Selene has lived predominantly through All Moonshine. Within the All Moonshine branch is Sir Tristram. This powerful but cranky horse was no world beater on the track. However he became the most sought after stallion in New Zealand breeding history with his remarkable record as a sire. Sir Tristram sired one hundred and forty stakes winner, forty-five of which are group one winners. Sir Tristram is actually inbred to Selene 5×4. His own sire Sir Ivor has a daughter of Pharamond II as his second dam. The line of Sir Tristram is still potent thanks to his direct male descendant Lonhro. Selene was bred in 1919. She is unquestionably one of the Queens of sire producing broodmares in Thoroughbred history. She may have been small in stature, but she was huge in influence. A truly “Magical Matriarch” in every sense. It is my understanding that the foal in the photo is All Moonshine. Queen Sucree was the dam of Ky Derby winner Cannonade who sired Belmont Stakes winner Caveat who sired turf multimillionaire Awad. You are very correct Skye. The foal beside Selene is indeed All Moonshine. TY, because I automatically assumed the foal was Hyperion. 1948 American TC champ, Citation, by Bull Lea o/o Hydroplane by Hyperion. Hyperion by Gainsborough o/o Selene by Chaucer.